From the developer: A Day in the Life of Bob was my first major undertaking. It was the first game I tried to make in Game Maker, but it took several tries before I actually created a working engine. 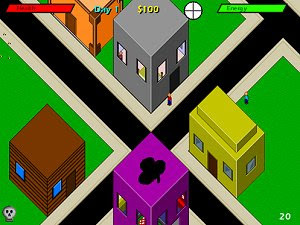 The game is a life simulator heavily inspired by the Flash game, StickRPG, but with its own unique twist. Plenty of surprises and numerous placed to explore will ensure a fun playing experience. This is, by far, my most popular game.